The ImmersionRC 700mW 2.4 GHz Transmitters have been designed for First Person View applications; the ImmersionRC 700mW 2.4 GHz Transmitters are small measuring just 57 x 23 x 12mm's, and are lightweight (22 grams) and are supplied with a 3dBi 2.4 Ghz Omni-directional antenna (SMA connector) & the cables needed to link to both the battery, video and audio from a camera into the video transmitter. 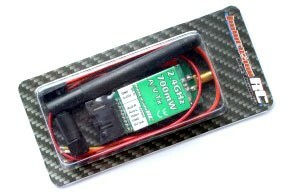 The ImmersionRC 700 mW 2.4 GHz video transmitter will operate on a battery voltage in the range of 6-25 volts, which means that you will be able to power the transmitter directly from a 3s to 6s battery without any additional voltage converters, on board the transmitter there is a quiet switching regulator, this provides power supply at 5 volts to use for powering cameras that need a 5 volt feed (including cameras like the Fat Shark PilotHD 720p HD FPV Camera). The ImmersionRC 2.4 GHz video transmitters operates on the following frequencies: 2370, 2390, 2410, 2430, 2450, 2470, 2490, 2510 MHz and the audio channels allows an easy way to use a telemetry downlink for the more demanding user.The use of 2.4 GHz video transmitters for First Person View flights means that there is no interference with radio controllers operating on the EzUHF systems and longer range video link can be maintained. Please note that the ImmersionRC 2.4GHz Video transmitter can't be used in all regions license free, please check with your local radio authority to ensure you comply with local laws throughout Europe and other countries on aircraft transmissions levels before ordering this product, a license might be required in your location to operate this equipment legally both on the ground and in the air. Please Note: Never power up a transmitter without the antenna attached. This will damage the transmitter which is not covered by warranty. Additional cables might be required to connect a camera if they are not supplied with the camera you wish to use. Do Not Use 2.4 Ghz radio controllers with this product.